The U2 album cover might show just a single Joshua Tree, but a visit to the National Park provides any visitor the chance to hike among thousands. Every few feet down a trail I discovered the next one and the next perfect photograph. After over a hundred different photos, I started to realize although each picture different, there was a constant theme – the beauty of the Joshua Tree National Park. From the Joshua Trees themselves to the desert fauna, rock formations and the Cholla Catcus Garden everything seemed more beautiful than the next view. Gorgeous. And all before one of my favorite moments of any day in nature – the sunset. As a self proclaimed sunset connoisseur I asked for viewing recommendations even before I entered the park. Where was the best place to watch it? Although each person mentioned the magic can be captured from any vantage point, a maxim I know hold to be true, I forced suggestions. The consensus – Keys View. Off course, I thought about the countless sunsets Florida Keys Sunsets I enjoyed. All magical. But today would prove quite different. No water and no warmth in the seasonally cold California desert. Keys View overlooked a small mountain range and the famous fault of San Andreas. To see the sunset, I needed to brave the chilling whipping winds. On the walk up I snapped an image of the earth’s heat from behind a tree and continued my climb. Then from the apex, I watched the sun descend and illuminate desert fauna. Another sunset memory to cherish. 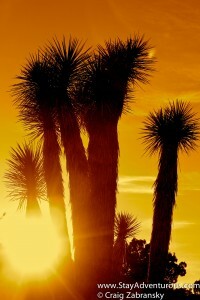 But at Joshua Tree National Park the sunset starts what can be considered perhaps even a more beautiful view, the night sky. This corner of California provides visitors a great chance to gaze at the heavens. A chance to witness and wonder upon some of the best views of the constellations in all of America. So after the view from Keys View I drove back across the National Park to the Desert Lily B&B for a slated “star tour.” The B&B owner arranged for a local resident to “teach” her guests about the night sky. What began at sunset continued through the night. For a few hours that day I watched the sky, first the sun and then stars in all their majesty. A special thank you to Carrie, owner of the Desert Lily Bed & Breakfast, for arranging the star tour and recommending Keys View. Such a poetic picture…I have never been to the Keys but am dying to go. 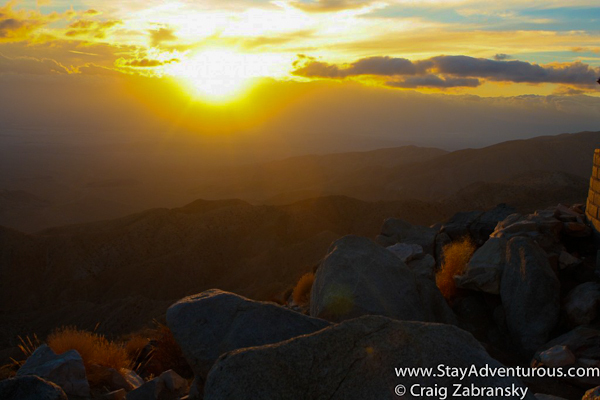 Both the Florida Keys and also Keys View in Joshua Tree National Park, CA are beautiful places to watch the sunset and enjoy time in nature. Good luck getting to both. The pics just ooze peace, love, and happiness. This is the moment of the day when I easily yield to my emotions. Is there anything more beautiful than a gorgeous colorful sunset? I doubt. Thank you Craig for sharing these photos and reminding us of a fantastic time at the end of each day when we can enjoy the end of the day. Rahman, I so agree. The sunset is magic and why I created sunset sunday. I also look forward to seeing the sunset inside Iran one day too, I’ll be sure to ask you for a recommendation.